Some Muslim women called his remarks insulting, but other Muslims said they understood his concerns. Mr Straw has dismissed suggestions that his remarks are designed to raise his profile ahead of Labour's deputy leadership election. He has yet to confirm whether he will join the race to succeed John Prescott but is widely expected to do so. Mr Straw is Labour MP for Blackburn, where between 25% and 30% of residents are Muslim. He sparked controversy when he told his local paper he asked female constituents visiting his surgery if they would uncover their faces. He said he made sure he had a female colleague in the room when asking someone to show their mouth and nose - and his constituents had so far always agreed to do so. Asked on BBC Radio 4's Today programme if he would rather the veils be discarded completely, Mr Straw replied: "Yes. It needs to be made clear I am not talking about being prescriptive but with all the caveats, yes, I would rather." Mr Straw explained the impact he thought veils could have in a society where watching facial expressions was important for contact between different people. "I come to this out of a profound commitment to equal rights for Muslim communities and an equal concern about adverse development about parallel communities." Mr Straw stressed it was a choice for women and he was making a request and not a demand. "What I've been struck by when I've been talking to some of the ladies concerned is that they had not, I think, been fully aware of the potential in terms of community relations," he said. "I mean, they'd thought of it just as a statement for themselves, in some cases they regard themselves as very religious - and I respect that - but as I say, I just wanted to put this issue on the table." He said he was worried the "implications of separateness" and the development of "parallel communities". Tony Blair's official spokesman said the prime minister "believes that it is right that people should be able to have a discussion and express their personal views on issues such as this". The spokesman said Mr Straw's comments were not government policy and he refused to reveal Mr Blair's views on the issue. Mr Straw's comments have provoked a mixed response from Muslim groups. 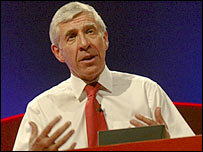 The Islamic Human Rights Commission called Mr Straw's views "astonishing" and accused him of discrimination. The Protect-Hijab organisation said the "appalling" comments showed "a deep lack of understanding". But Dr Daud Abdullah, of the Muslim Council of Britain, said he could understand Mr Straw's discomfort adding that women could choose to remove the veil. Labour's Baroness Uddin said debate was needed but perhaps not in the way Mr Straw had framed it. She was worried he had talked about veils being a statement of separation - that acknowledged the government's failure to ensure Muslim women were "part and parcel" of British society, she argued. Conservative policy director Oliver Letwin said it would be "dangerous doctrine" to tell people how to dress. And Liberal Democrat president Simon Hughes: "The experience of visiting their MP is difficult enough for many people without having to consider a dress code."